Over the last month these six items are the new additions. I had $5 of credit to use on eStarland.com and decided to purchase a used copy of Ratchet & Clank: Into the Nexus. It also was what gave me the idea to do my month of Ratchet & Clank games, #RatchetNov, which I am currently in the middle of. Tempest is one of those classic 1980s arcade games which I find quite fun to play. An upgraded version of the game on the Atari Jaguar called Tempest 2000 is considered one of the best titles for an otherwise horrible gaming system. Well did you know a further updated version of the game was made available on the original PlayStation? It’s called Tempest X3. As soon as I heard about it I had to have it. It was a cheap pick up on eBay. Finally there’s Sniper Elite V2 and Payday: The Heist. On Steam a few weeks back there was separate 24-hour periods where these games were made available for free. I was somewhat interested in checking the game out and free certainly helped in my decision making. I also was able to find a couple movies on Blu-ray for a good price with extras included. Top Gun came in one of those sweet Steelbook cases. This is something I don’t have many of. The only other one I can think of that I have is the game Mortal Kombat: Armageddon for PS2. Mrs. Doubtfire was the other film I got. It has a lot of neat footage of early makeup tests and a good featurette of the idea of what message the filmmakers wanted to say within the story. Recommended for sure. Recently there was a Steam sale. I know. This isn’t an unusual sight. However for me to be interested in any of it is unusual. I don’t prefer gaming on a PC even though I did a lot during my college days. Those were the days of amazing Half-Life modifications like The Specialists, Front Line Force, Vampire Slayer, and many, many more. Anyways, said Steam sale had Bastion for a considerably lower price. I said on Twitter that “if someone were to buy Bastion on there for me then they could also be a better person. *hint*hint*” NiceGuyNeon replied to me asking if I had Steam and would play the game. I said yes to both and it was done. I had myself some Bastion. Thanks, again, bruh! Also a quick mention for Sniper Elite V2. It was available for a short period of time for free to anybody on Steam. I picked it up too. 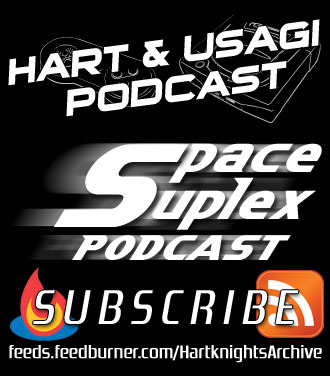 24bitAJE and HartKnight review the WWE Payback 2014 PPV and the June 2nd RAW. HartKnight and usagi704 welcome ebbderelict and chat God of War: Ascension, FCC funded Congressman double crosses them, Watch Dogs, the Hyperkin Retron 5, and more. Leave a comment Posted in Collecting, Gaming Tagged bastion, pc, rebellion, sniper elite, steam, supergiant games, warner bros. Without a doubt the big attraction/gimmick this game tries to draw gamers in with is the slow-mo of the bullet creating huge damage to the enemies. It is definitely a reason I loved watching other gamers play it via live streams on Twitch TV when it was first released. After trying it, however, I wasn’t as enthralled of having to find the enemies myself. It’s one of those games where I just have more fun watching somebody else play. A personal example: I have a friend who’s quite good at Mega Man games where as I’m not. It’s great to see him make short work of what frustrates me in some of those games. This edition of the Dirt racing series seems like a mainstreamed/dumbed down version of Dirt 3 to me. While I haven’t played the full version of Dirt 3, the demo for that games was a better slice of final product. Here it’s only one track and one car. It was simply not enough to even attempt at a good impression. The supposed gimmick in this first-person shooter is sand (and lots of it) with the setting being in the Middle East. The reason I say “supposed” is because the sand isn’t really affecting gameplay in anyway. It’s just there like the rest of the scenery. It might change the route you take suddenly, but that change simply takes place in a cutscene like in any other game. Overall, this new Spec Ops is competent and better than I expected it would be, but that’s not saying much in a market currently flooded with tons of me-too bland military shooters. Over the week of E3 I saw a number of things that got me more interested in some games that I previously wasn’t sure how I thought about them. Here are those games. Metroid: Other M – My first thoughts when this game was originally announced was that it’d be the typical wagglefest that I’d come to expect from a Nintendo IP. To my surprise the controls were as basic as they could get. Holding the remote sideways using the d-pad and 1 and 2 buttons. There’s some occasional moments where the player will aim light gun style for scanning and shooting some enemies, but that sounds like it’s the majority of how the game controls. Sounds great! Mortal Kombat – The pre-E3 trailer was just a tease and didn’t do all that much for me. However, once I saw that GameSpot stage demo, I was sold. This new MK looks to have a solid fighting engine. Combine that with a ton of nostalgia and it’s a sure fire win! Medal of Honor – I didn’t care for this reboot of a somewhat on again/off again great FPS franchise. After seeing its showing at E3, I still don’t really care. It looks way too much like Call of Duty to where that’s what first comes to mind when I see footage of it. The only thing that got my attention was the PS3 exclusive bonus of a remake of Medal of Honor: Frontline. It’s my favorite of the series and is the only reason I’ll probably pick the main game up. Twisted Metal – I’m not as big as a Twisted Metal fan as I may let on, but I have still enjoyed most every game of the series with Twisted Metal 2 being the one that sticks out the most. The online modes look to be the most interesting of this newest game as it will mark the first time I’ll be playing others not sitting next to me. God of War: Ghost of Sparta – At this point I’m somewhat overcome with a bit too much of Kratos’ adventures which is why I took a break from finishing up God of War III from back in March. With that said, I was loving the graphical look of the upcoming PSP entry from the GS stage demo. The water effects were especially impressive. Of course I’ll be getting this game. Homefront – I’ve played/seen these shooters before. They’re those what if scenarios of the United States being invaded with the point of view being from a common everyday person and how they deal with it. Freedom Fighters had it be the Russains, Turning Point had it be the Germans, and this game has it being the North Koreans. Hopefully this will be the one I actually like. Red Faction: Armageddon – Here’s another stage demo that changed my mind on the game in question. It was a safe bet to think that this would be very similar to last year’s game. To my surprise it’s not as open of a world. But it does seem to have fun weapons to use. One in particular can reform destroyed structures so you can ruin them again. I’ve got a lot more to say, but I’ll reveal those thoughts at another time. The responses for what game I bought from Gamefly was quite amusing, but all incorrect. You guessed the following games. It was, in fact, Rogue Warrior. Check out this hilarious Giant Bomb quick look of the game. Thanks for playing and good day, folks! Comments Off on Post E3 Game Thoughts Posted in Collecting, Gaming Tagged bethesda softworks, danger close, e3, ea, eat sleep play, god of war, homefront, kaos studios, medal of honor, metroid, mortal kombat, netherrealm studios, nintendo, ps3, ready at dawn, rebellion, red faction, rogue warrior, scea, team ninja, thq, twisted metal, volition, warner bros. Double Dragon, Battletoads, Super Mario All-Stars, and more! Here’s a quick list of games that I most recently bought.